Check out the new releasses at Elzybells Art Stamps. They have some super cute new stamps & you have to see the teddys. So cute!!! Hop on over to their blog for a great candy offer. I made this card for my PCP group, Susana's Custom Art & Card Design. I just had to get this stamp from Susana's store when I saw it. He is just so cute and I just love the puppy. What fun they are having. What do you think? Ready for a ride? Here we are...20 years ago. 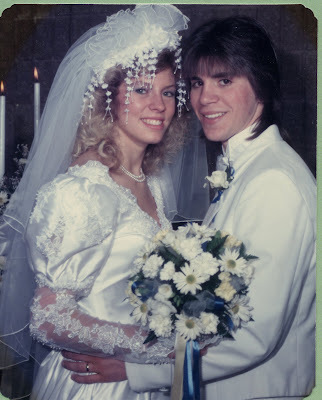 Mae & Steve Wisor married in Federal Way, WA February 18th, 1989. My best friend Michelle & my cousin Cherlynn were my maid of honor & brides maid and Bill & Rick stood by Steve. I had to scan this picture in at work. I have this one sitting on my desk so it is becoming faded by the light. That reminds me...I need to work on our wedding scrapbook. I think 20 years is about the right time to do it, don't you? Too bad Steve isn't into that long hair anymore. I really liked it, but he has such straight hair he always wore a hat. Now I cut it for him using at #2 and 3 blade cover. Nice and short. His motto is if he can grab any hair, it is time for a cut. Here we are 20 years later with a 6' 3" 15 year old son that has football workouts tonight, baseball lessons tomorrow & Friday and football workouts & camp on Saturday. We were planning a big Hawaii or Mexico trip for our 20th, but with Nic's schedule, the general economy and such we are going to spend some time in Las Vegas during spring break in April. The plane is book, the resort reserved, the baseball tickets in hand (Seattle Mariners vs. Colorado Rockies in Vegas)...I just need to reserve the kennel for Zoom & get a car set up. I am ready for sun, sun, warm weather, some slots & craps tables and more sun. Nic is excited to go in the rides on top of the Stratosphere. Have you seen those rides??? How can any sane person want to do that? The boy has lost it!!! I made these two cards for my hubby & son. Our 20th wedding anniversary is the 18th so I made a basic card that wasn't too too on the frilly end. I used all CTMH materials. This cute guy is my sons Valentines card...I know the bling isn't that manly, but I liked it. I received the image from a sweet blogger and the sentiment is from my bella stash. I was able to use my nesties given to me at Christmas and more of my CTMH stash. What a bunch of fun goodies!!! She gave me a fixitfella from Stampingbella. This dude will come in so handy as I make cards for my husband & create our "Home Improvement" album. I am waiting on the "after" shots as things are still in progress but hopefully by the end of 2009 I will be able to have them taken & begin on the album. What a sweetie she is. Lara is offering some blog candy...and she is looking for suggestions in naming her fish. Check it out!!! It takes a mother to love the looks of him. Ally is offering some blog candy from my Stamp Box. She has been choosen as a design team member!!! She is also allowing more than one comment so you are able to get additional entries. This offer runs through February. Hop on over & give it a try. After Nic's basketball game in the morning (they lost by 1 point - & I am sure the scorekeeper didn't give us credit for one of Nic's layups) and a rushed trip to the grocery store we headed off to my brother-in-law's to watch the game. Mark (BIL) is a total Steelers fan. Having been born in Pennsylvania & living there for his first 10 years or so...he has always love the Steelers. Now my husband Steve on the other hand also born in Pennsylvania and living there for 8 years is a Raiders fan. You can see by the room decorations, that Mark is over the top!!! Here is Nic not looking at me & Steve is learning how to work our new phones. We were debating on the Blackberry storm, but really liked how the Samsung Omnia works. Steve finally smiling for the camera. I get goofy looks most of the time or he out right hides, so the few I get I cherish. Nic is ready for the 3-D experience. Mark, Nic & my step father-in-law Eldon. We called them the 3 stooges. Isn't this room too much. Way too much in my book. I was so hoping to be left home to work in my craft room, but was guilted into coming. I did take my laptop & blog hopped during the game. Not all was lost, but I didn't win anything from my superbowl squares. Oh well. Check out Jackie's super sweet "Sugar Nellie" blog candy. She is doing a PIF offer & I have my PIF all ready if I am the lucky winner. I love these stamps, just received one on Saturday. I have decided to sell my Brother sewing machine & Bind It All. I have only used each of these items once. I thought I might sew something, but just repaired a patch on a shirt & I just don't get the bind it all. I love what it can do, but really think I can spend my $$ on something else more suited to my needs. Both items are in brand new condition and are listed on eBay!!! My user name is hubmonkey_2000, so check them out if you are interested. I am hoping to purchase a small sewing machine to use on cards & scrapbook projects, but need the sales first.